We want your enthusiasm, kindness and caring to support children in the dining room and on the playground at lunchtimes! 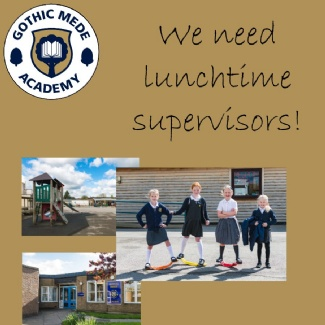 We have a vacancy on our current team of midday supervisors. Interested? Please contact the HR Assistant, Christianne Crook, in the school office 01462 732002, GMA-Office@bestacademies.org.uk or pop in to have a chat.